While I have been thinking about an interdisciplinary law-and-war-related project for some time, I started putting thoughts on paper in a more focused way on this blog and elsewhere in response to reactions to my new book, War·Time: An Idea, Its History, Its Consequences, and related commentary. So I must especially thank Benjamin Wittes of the Brookings Institution, to whose comments I earlier responded in a post here. 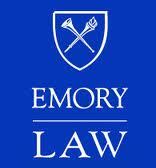 There are a few reasons that this project will be at Emory. Most important is that the law school is at the beginning of a promising era, with the appointment of Robert Schapiro as Dean, which has generated much excitement on campus. The university as a whole is a terrific fit for this project due to significant interest in war in the Political Science Department, beginning with its Chair, Daniel Reiter. Human rights history scholar and long-time friend Carol Anderson is also at Emory, along with others at the law school and elsewhere on campus who I look forward to collaborating with. And then there’s the end of cross-country commute, and other family-related reasons that make Atlanta attractive. Having a lateral offer is always a good time to pitch a new project, and both deans offered full support for the start-up. It is a project instead of a center because I think that not every idea needs a center and the bureaucracy that can go with it, so the focus will be on ideas and not infrastructure. At least for now. The project’s first event will be a fall lecture by legal historian John Fabian Witt, Yale Law School, who will discuss his exciting book set to be released this September, Lincoln’s Code: The Laws of War in American History (date and details to be determined). A grad seminar and colloquium series will begin in spring 2013. I will also create a web presence for the project, and which I’ll post about when that’s up and running. This Project proceeds from the premise that the study of law and war is necessarily an interdisciplinary inquiry. Legal scholars often carefully analyze the law, but they take "war" as a given – as a feature of the world that does not require the same close interrogation. There have been compelling reasons for the narrow focus of other programs, as the changing nature of warfare presents new legal and policy questions. But a full understanding of the intersection of law and war/security requires a broader canvas. It is best pursued in an interdisciplinary environment involving scholars and law and graduate students trained in different fields. This idea paper proposes a workshop series and related courses and programs aimed at an interdisciplinary approach to the study of law and war. The core of the Project would be a deeply interdisciplinary workshop series, modeled after the Project on Rhetoric of Inquiry, a brilliant and rigorous seminar directed by economist Deirdre McCloskey at the University of Iowa in the 1980s. Ideally the Project will eventually expand to include post-docs and other components, but this will depend on outside funding.